Cool. So which restaurants can I go to that have enabled this feature? Nice! When will it be coming to us Android users? Can I decide whether a 20% tip includes the tax or not? Please note that you must have an invite to try out the app. We hope to expand to Android at some point after this pilot program concludes. At the moment, that calculation includes the tax. How can we be assured that the restaurant knows we paid rather than look like we’re dining and dashing? This is a great idea and I think it will prove quite popular. Question though: why are rewards points still delivered via paper check? What’s the fee structure like? I’ve been looking into loyalty programs and mobile payment options for the brewpub where I work and everything is priced in such a way so as to take a big chunk out of the restaurant’s margin of profit. It’s just my two cents but it seems that while SAAS providers think they’re pricing themselves competitively, what they’re really doing is joining their competitors in making themselves inaccessible to anyone other than the largest chains or the most high-end establishments. It limits your market and opportunities for small businesses to grow with the help of such tools. Can you send me an invite? I’d like to try this feature! I would love to provide feedback for this app!! How is this different from apps like Dash (http://thenextweb.com/apps/2013/11/19/dash-app-lets-simply-press-pay-walk-restaurant-bar/#!uDhjN) or Cover (http://thenextweb.com/apps/2013/10/01/cover-launches-its-dining-out-ios-app-to-eliminate-waiting-for-the-check/#!uDhSR)? Why would I use your company’s app over these two? Congrats on a great concept. Who are you partnering with as the processor for these transactions? How will the transaction be coded? Personally, I eat out a lot and enjoy the 2x rewards I get on my CC at dining establishments. I’d like to receive an invite to participate. Sounds exciting. Philadelphia next, please! Also, I echo John’s question. Will this allow for electronic delivery of dining rewards checks? I already have a reservation at the Boxing Room coming up next week. I would love an invite. Hi Dimi: We are in a very limited beta, but soon will have a link where you can request an invite as we open it up more. Thanks for your patience, Caroline Potter, Chief Dining Officer. Hi Maja: We are in a very limited beta, but we will soon have a link where you can request an invite as we open it up more. Thanks for your patience, Caroline Potter, Chief Dining Officer. Hi Jason: We are in a very limited beta, but we will soon have a link where you can request an invite as we open it up more. Thanks for your patience, Caroline Potter, Chief Dining Officer. Hi John: We are in a very limited beta, but we will soon have a link where you can request an invite as we open it up more. Thanks for your patience, Caroline Potter, Chief Dining Officer. Hi A: We are in a very limited beta, but we will soon have a link where you can request an invite as we open it up more. Thanks for your patience, Caroline Potter, Chief Dining Officer. NEED that in NYC. Always rushing everywhere!!!! Hurry. Will you expand to canada soon? Will the app allow users to easily split the tab? I tried using this in a participating restaurant and the waiter told me it wasn’t accepted. I showed him my phone and he said he’d never heard of it. He then made me pay with a credit card. So I was charged twice and got no benefit. Love this idea. 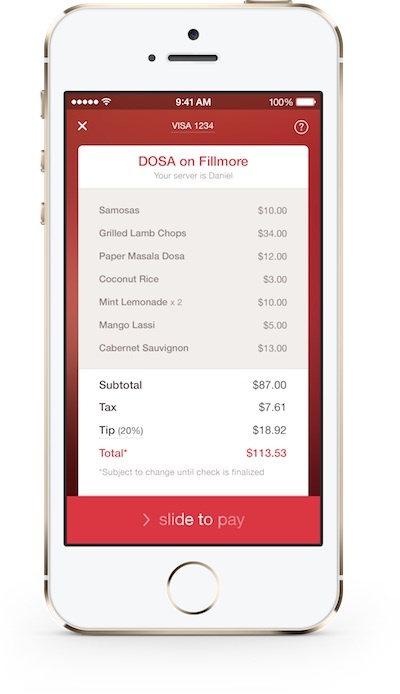 How soon will you roll this out, for all restaurants, for all devices? Can’t wait. Will the app include a way to use reward cheques? I run a restaurant with Micros 3700, is it compatible with this application? What restaurants are participating in NY especially in the theatre ?